Relax and rejuvenate after a busy day. Stay in a comfortable Regular King category room and start of the next day with a free Buffet breakfast. All for N26,000 / night. Click the book now button below and our reservation form will autofill your special offer category. Complete the rest of the details and you are all set! Or call us now at +234-8120946333 / +234-8073590868 to make your reservations. 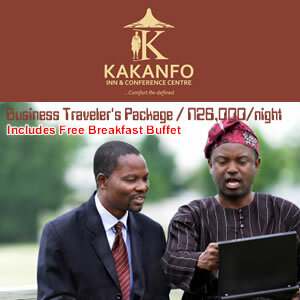 We look forward to welcoming you to Kakanfo Inn and Conference Centre.